Do you use reading glasses or bifocals and ride bikes? You may benefit from Dual Eyewear sunglasses, which combine a sporty frame with a lens that has magnification on its lower half. 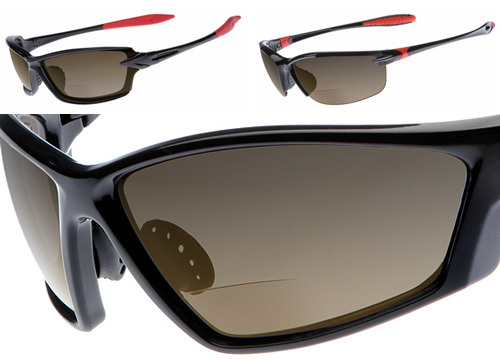 Essentially bifocals for active types, Dual Eyewear addresses the issue of needing to see cycling computers, GPS devices, or your watch up close while rolling down the road. Looking forward while riding, vision is not manipulated; they are normal sunglasses. But look down to read your speed, heart rate, or other stats and the Dual Eyewear provides magnification to make things more clear. While none of our testers wear bifocals, we tried out the glasses and can say that they seem to work. The glass is clear, and the magnification area is not too noticeable while pedaling until you make an effort to glance down. The lightweight, sport-styled shades come in three styles, all equipped with the “optimized magnification zone” so you don’t have to squint when you look at a small screen. The glass, a shatter-proof polycarbonate, comes in clear and amber. The lenses are 100% UV protecting, and the frame has a solid feel on the head with wrap-around bows and a non-slip rubber nose piece. They are super light, with the Dual SL2 model tipping the scale at just 20 grams. Dual Eyewear glasses sell for a reasonable $50 a pair and are offered in three magnification levels for a range of eyesight needs.